Thus our previous Holy Thursday devotionals to Kyries Kitchen (2008) and Saints of Bury (2009). Doesn't get any more appropriate than a trip to the chippy on the day before Good Friday, so arranged via the ongoing miracle of Outlook to meet The Boy Grenvyle outside Admirals on The Heath. Five minutes on two wheels for me, twenty minutes on four wheels for him. Number 11 (twixt the chemists and the post office) used to be an estate agents but is now far more gainfully employed serving pizza slices, jacket spuds, and shedloads of chips. Big G. goes for the nuggets - thought he'd have the frying-today rock eel -- while I go for the dream combo of chilli and chips. What with the wind outside, would have been ideal to sit inside at a table (like J's down the road). Friendly folk running the joint say that planners wouldn't allow any seating: boo to the clipboard kings. Instead, it's a short walk across the concrete plaza over to the Douglas Bader pub to borrow the use of an outside table, tut-tut. Here's a turn-up: I'm freezing, Grenvyle's fine, though we're both reminded of the f-f-freezing Woodbridge riverside shelter. Sitting at that bench, in the shadow of the clock which is right six months a year, I learned that the least efficient way to eat chilli and chips is with a small free wooden fork. Most grateful when the last tasty kidney bean is gone and we mutually agree to retire to the Tesco caff for warming beverages, where they managed to burn my giant hot cross bun. 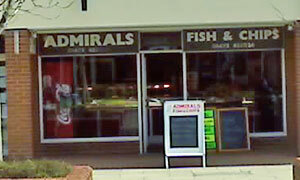 Set sail for Admirals on the Heath: four stars. If it was a car -- Opel Admiral. If they were passing by -- Sean Connery.